I got home last Friday night really, really late and when I opened my Facebook account, I received a message form my sister. 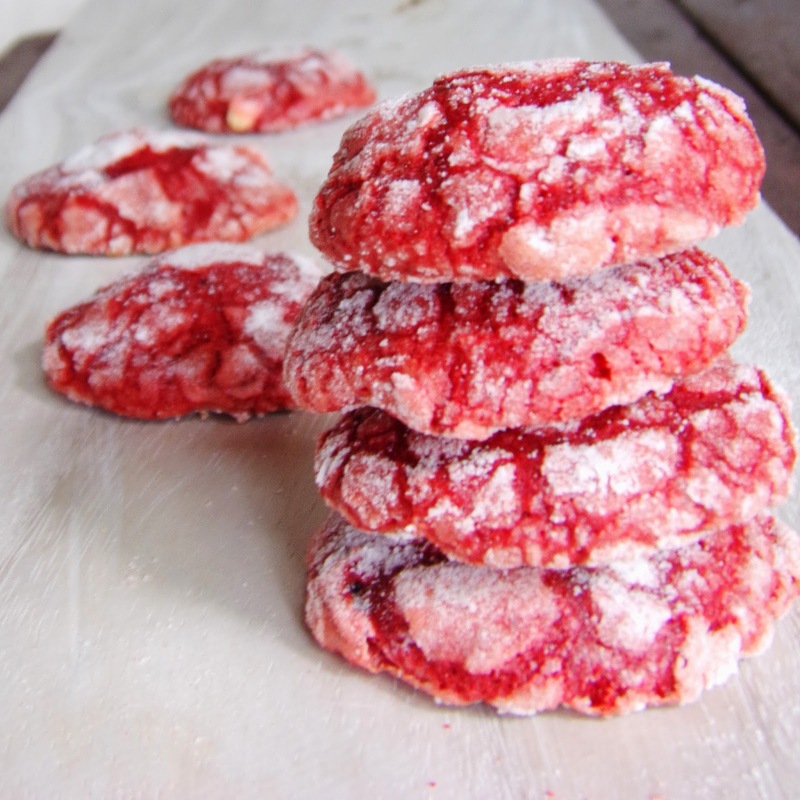 Well, she requested me to bake a red velvet crinkles. I don’t know why but may she ate one and gave her the idea to sent me a request to bake one. I hope she brings a red velvet crinkles one of this day and I hope you’re reading this. I quickly search for red velvet recipe in the internet. I picked out one recipe from the first page of my search and read some comments and thought that I should try this one. By the way, I got the recipe at Cooking Classy. You may want to check out the original recipe. I did some tweaking of the recipe. I omitted the milk, since I don’t have milk and I don’t want to buy a can of milk for a tablespoon in the recipe. I replaced the lemon juice with white vinegar since lemon is expensive to buy. I dissolved the baking soda in white vinegar and added it at the last stage before adding the chocolate chips. I baked my red velvet crinkles at 180 degrees Celsius for 12 minutes and leave it to cool on the baking pan for another 5 minutes. Combine flour, cocoa powder, baking powder and salt. Mix using a wire whisk until everything is incorporated. Set aside. In a separate bowl, beat the butter using an electric mixer for 3 minutes. Gradually add the sugar and beat until you have a pale yellow mixture. Add egg one at a time beating 3 minutes upon each addition. Add vanilla extract and food color and beat for another 3 minutes. Mix in the flour mixture a half cup at a time. Be sure that the flour mixture is well incorporated into the batter. Combine vinegar and baking soda and add to the batter. Mix for another 2 minutes. Add in the chocolate chips and mix using a wooden spoon or a spatula. Refrigerate for at least four hours or overnight. This is an important step. Like breads, we want our batter to rest. Cold batter is also easy to work with compared to room temperature sticky batter. So be patient. Sift icing sugar in a bowl. Scoop the red velvet crinkle batter batter using a 1 ounce ice cream scooper. Roll it on the icing sugar and place on a baking pan lined with baking paper. Slightly press the batter and bake for 12 minutes. Remove the batch form the oven and let it cool on the pan for another 5 minutes before transferring onto a wire rack.